Despite recent rainfall, levels at most lakes that are primary sources of water for some large Oklahoma cities remain below historic averages. Data collected by Oklahoma Watch, and translated into charts accompanying maps below, indicate that eight of the 10 lakes used by Oklahoma City, Tulsa, Norman, Lawton and Stillwater are significantly below normal levels. The blue lines on the charts represent lake elevations over time. Red lines represent the lake’s normal levels. Click on any city’s name to go directly to the map showing that city’s water sources. Oklahoma City’s system serves more than 500,000 people and is supplied by Stanley Draper, Hefner, Canton and the Atoka Reservoir lakes. 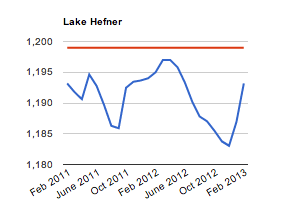 Analysis of lake levels shows that all four lakes are significantly below normal. Spavinaw Lake, Oologah Lake and Lake Eucha are the primary sources of water for Tulsa. Spavinaw’s level is above normal, while Oologah and Eucha are about four feet below normal. Located east of Norman, Lake Thunderbird is the city’s primary source of water. Its level is about eight feet below normal and has declined significantly over the past two years. Lawton receives water from Lake Lawtonka, which is located north of Fort Sill. The lake’s current level is two feet below normal. Over the past two summers there were two significant drops in Lawtonka’s level, and another decline could occur again this year if the drought continues. The City of Stillwater receives water from Kaw Lake, located 10 miles east of Ponca City. Unlike nearly every other lake analyzed, Kaw Lake’s level is currently at normal. The level has dipped only twice below normal in the past two years. Sources: Oklahoma Water Resources Board, United States Geological Survey. For more information on lake elevations: Lake Hefner, Lake Stanley Draper, Canton Lake, Lake Atoka Reservoir, Lake Thunderbird, Spavinaw Lake, Lake Eucha, Oologah Lake, Lake Lawtonka, Kaw Lake. An Oklahoma Watch searchable database allows you to find out how third graders in your school or district scored on the statewide reading test.